Personalizing your content allows you to enhance your engagement with the contacts in your HubSpot database. However, some of your contacts may not have a value for the personalization token property you've inserted into your content. 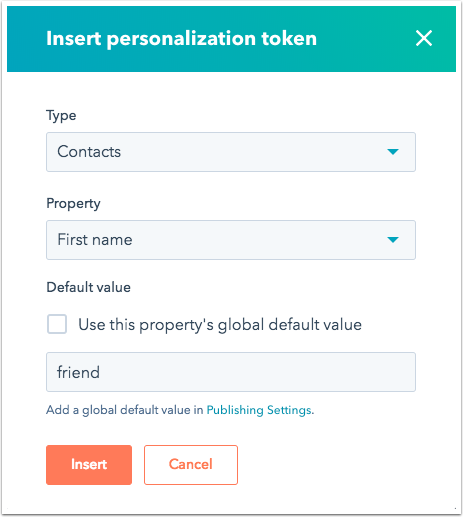 Default values that will appear in the place of the personalization token if contacts don't have a value for that property. 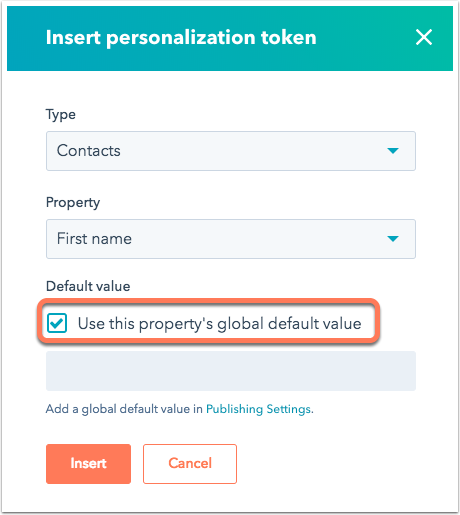 You can set local default values at the content level, or set global default values in your account settings. From your HubSpot Marketing Hub Basic, Professional, or Enterprise account, navigate Email, Landing Pages, or Website Pages. Locate the specific email or page you're looking to edit. Hover over the name of the page or email and click Edit. If you are creating a new piece of content, click Create email/landing page/website page in the top right corner. 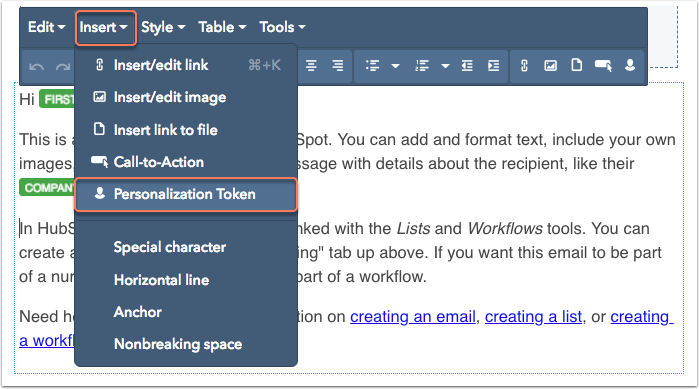 Within the page or email editor, click on the rich text module where you want to add personalization. In the module editor, click Insert > Personalization Token. Depending on the content you're looking to personalize, use the Type dropdown menu to select the Contacts or Company property types. Default values cannot be set for the Office Location category. 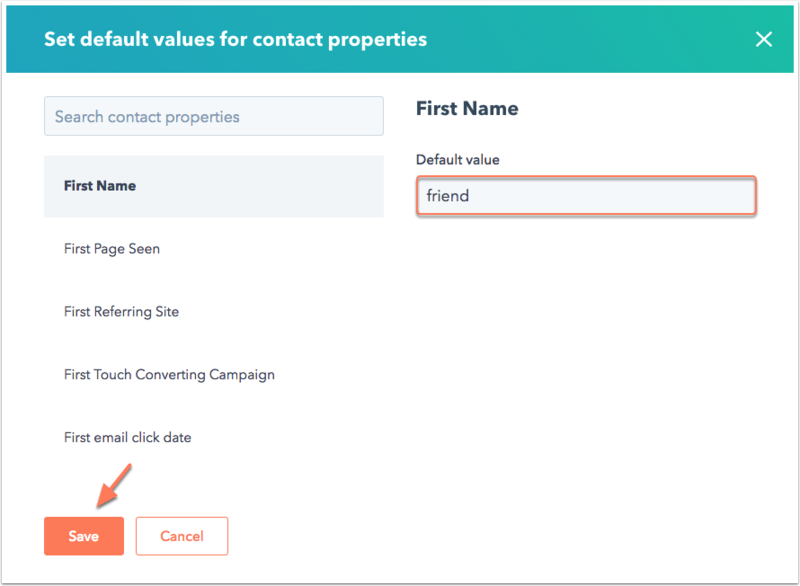 If you would like to use properties specific to the contact or company owner, which pulls from the HubSpot user profile settings, first select a property type then search for the owner property. From the Property dropdown menu, search and select the token you would like to add to your content. Enter a default value, then click Insert. Please note: global default values for personalization will only apply to tokens used in marketing emails. Learn more about personalizing sales templates. In the left sidebar, select Marketing > Web pages. In the Templates tab, scroll down to the Default values for page personalization section and click Edit defaults to edit either Contact property defaults or Company property defaults. In the dialogue box that appears, use the search bar to select a property, then enter a default value. Click Save. To set the default values for personalization tokens used in your marketing emails, in the left sidebar click Marketing > Email. In the Configuration tab, scroll down to the Default values for email personalization section and click Edit defaults to edit either Contact property defaults or Company property defaults. Once you have configured your global defaults, navigate to an email, website page, or landing page. In the rich text module, click Insert > Personalization token. Check the Use this properties global default value box, then click Insert.